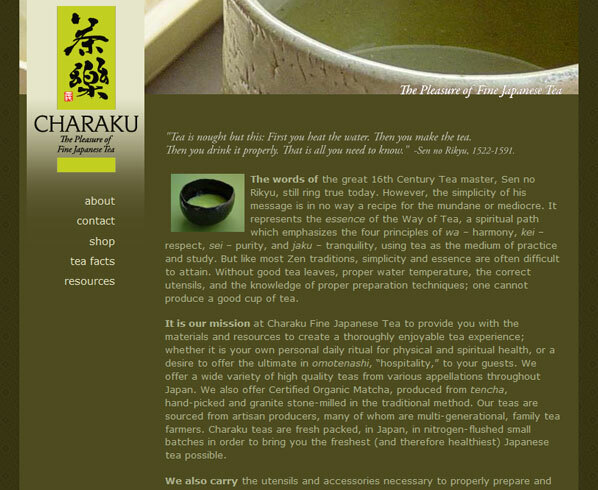 Charaku Fine Japanese Tea is a resource for Japanese Teas and Japanese Folk Craft known as Mingei. The owner wanted an e-commerce setup where he could update and track products himself. Since he had a Yahoo! Small Business account he wanted to continue using it to sell his products and accept credit cards, so we integrated a Yahoo! store on his site, that he now updates to his heart’s delight. The design evokes the elegant simplicity and textures of the Japanese folk aesthetic.